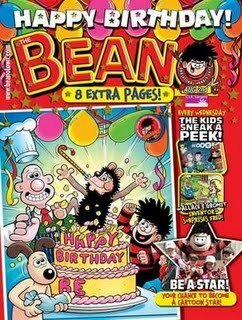 I can’t believe the Beano is 70 years old, and I refuse to believe it was over 50 years old when I used to wait for my weekly £1 pocket money to run round to the shops for my reserved Beano and a bag of penny sweets. Then lay on the living room floor and read it from cover to cover. I then used to copy the illustrations and could draw Dennis off by heart, ok, whooo!, I was only young. I then used to create my own little comics, think this could have been one of my first steps into graphic design. I wish I could find these now think they would be worth a laugh! The Beano had a huge circulation almost topping two million in the 1950’s and inspired many a budding animator and illustrator including Nick Park of Wallace and Gromit fame. Dennis the Menace, Roger the Dodger and the Bash Street Kids are all publishing veterans now, but the characters have all had the ability to stay with the times and remain eternal youngsters. The graphic style has changed along the years from the raggity sketchy originals to the smoother renderings of today. Nigel Parkinson has been drawing Dennis since 1999, described how the prankster has been given a bigger head and plumper limbs compared with David Law’s 1951 nobbly-knee’d ration-era creation. The history and this journey can be seen at The Cartoon Museum, 35 Little Russell Street, London WC1, ‘Beano and Dandy Birthday Bash! until the 2nd November. It is good to hear that all the drawings are still created by hand even the colouring, only the speech bubbles are added by computer. Beano artist Nigel Parkinson created this artwork for a special fans 7′ collectable of Kaiser Chiefs single The Angry Mob. Don’t forget, August 2nd (the cover-date of the anniversary issue) has been designated Gnashional Menace Day to raise money for CLIC Sargent, the Caring for Children with Cancer organisation.